Although tattoos can be a meaningful expression of one’s thoughts, feelings or individuality, sometimes that expression is not relevant to who you are now, or perhaps it is in conflict with your work or family values. No matter the reason, you’ve decided to have your tattoos erased, and you’re ready for the next step. Tattoos are essentially a mosaic – a picture composed of many small dots of ink injected underneath the skin. Those dots of ink come together like the pixels on a computer screen to form an image. The ink is composed of a substance which cannot be dissolved by the body’s normal enzyme systems; the particles are too large to be absorbed and carried away. Enter laser tattoo removal. A laser can be directed at the tattoo to gradually destroy the pigment over time. During treatment, the laser energy passes through the skin and is absorbed by the dark particles of ink. The ink particles absorb so much energy so quickly that they shatter, like a crystal, into smaller pieces, which can then be absorbed by the body and passed through its natural detoxification system. However, the ink cannot be fractured completely in one treatment, so it takes several treatments to remove a tattoo. A good candidate for tattoo removal has fair to medium skin tone, and has dark but not dense ink (e.g., blue ink, black ink) that is superficial in depth. The areas that respond best to laser tattoo removal are the arms, chest, buttocks or anywhere with good blood circulation. Fair- or medium-skinned patients react well to this type of treatment because the laser is able to target the ink selectively. In contrast, having a dark-colored tattoo on dark skin makes it difficult for the laser to differentiate between the ink particles and the skin cells. Laser tattoo removal is most effective on dark ink that is not dense because the laser energy can detect darker colors more easily than it can detect lighter colors such as yellow. Thus, dark ink is fragmented better than yellow ink. Ink density is also an important factor when removing tattoos because when more ink is present, there is more ink to fade. Superficial ink is also favorable because it is closer to the surface of the skin. With superficial tattoos, the laser does not have to penetrate so many layers of skin to get to the ink. A topical anesthetic is applied to the treatment area, and a chilled air system will also be used to diminish discomfort during the procedure. For an additional cost, a local anesthetic can be injected instead, if the patient desires. Patients often say that the treatment feels like being snapped with a rubber band. The procedure only takes a few minutes, and a light dressing is applied afterward. You will receive instructions about how to care for the tattoo. Complete healing takes about 5-7 days. We recommend waiting a minimum of 4-6 weeks between treatments. The number of treatments cannot be predicted prior to the start of your treatment series. Most tattoos can be removed in 6-10 treatments. Rarely does it take fewer than six treatments to remove a tattoo. Sometimes, stubborn tattoos require many more than 10 treatment sessions. The cost per treatment is based on the size of the tattoo. Larger-sized tattoos obviously cost more than smaller tattoos. We cannot quote exact prices without seeing and measuring the tattoo in person; however, the basic treatment cost is $150 for a tattoo that is roughly the size of a playing card. Coastal Plastic Surgery Institute offers the Candela Alex-TriVantage, which is the fastest and most powerful Q-switched Alexandrite laser system. The 755nm wavelength enables safe and effective treatments that are gentle to the skin. Additionally, the laser can be configured to work at 532nm and 1064nm to treat other colors. At Coastal Plastic Surgery Institute, we have performed thousands of laser tattoo treatments over a span of more than 20 years. We always strive to maintain the highest-quality treatment standards, using state-of-the-art equipment. 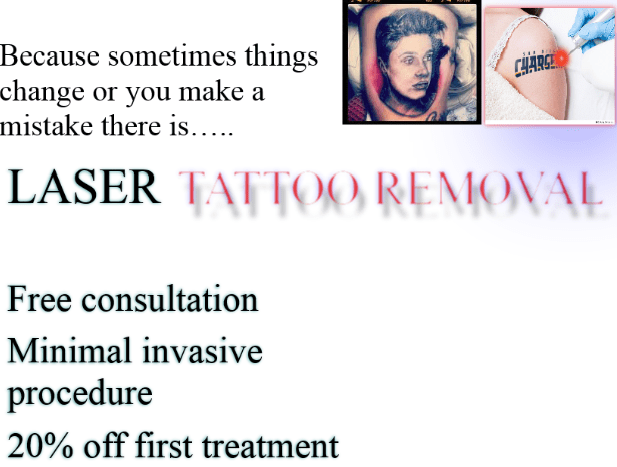 Call (850) 233-7674 today for a consultation, or email us and see for yourself what laser tattoo removal can do for you!